Would you believe there’s all kinds of fresh food, free for the taking out there in the great outdoors? If there’s a forest or a meadow nearby, you may be able to forage for some delicious fall edibles. Apples. The end of the apple season is almost here, but, depending on where you live, you can still find some later varieties of apple. Wild apples are usually organic, so you might find some worms in them, but you’ll also know they aren’t coated in pesticides. Mushrooms. There’s possibly an edible mushroom growing in your backyard right now. Wild mushrooms can be found all over the world, and many varieties are perfectly safe to eat. (Of course you shouldn’t eat a wild mushroom unless you’re 100% sure it’s safe, so do your research before picking anything.) Personally? I adore wild morels and chanterelles. Grapes. Wild grapes grow all over the place. If you find a vine full of juicy wild grapes, they will make a wonderfully healthy juice, jelly or maybe even wine. 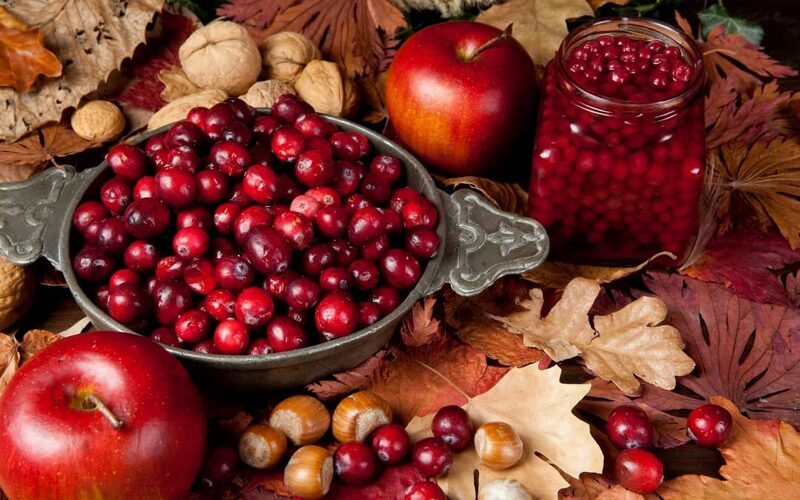 Cranberries. If you live around a marshy or boggy woodland, you might be lucky enough to find cranberries growing wild. You may also find cranberries growing on shrubs. Pawpaw. Pawpaw fruits are just now starting to be commercialized. Pawpaw tastes a bit like banana, melon and mango all rolled into one fruit. This fruit grows on trees and looks like clumps of mangoes growing in a bunch. Pawpaw is difficult to find in the wild, but if you can spot them, the taste is worth the search. Walnuts. Walnuts are the holy grail of foraging. If you’re fortunate enough to have walnut trees growing nearby, get yourself some of those delicious nuts! The fruit of the walnut tree are large and round like tennis balls. Once the fruit has dried, go ahead and crack the shell to get to the nut inside. Rose hips. After the leaves fall from the rose bushes, it’s easy to spot rose hips. Rose hips taste best after the first frost. They don’t taste very good when they’re raw, but rose hips are quite tasty cooked. You can mix rose hip juice with honey to create a nutritious fruit syrup.